Thank you for your interest in working with Ron Howard & Associates of RE/MAX Preferred. Our team of Agents work with buyers and sellers across the greater Baltimore, Anne Arundel, Harford & Howard region. Whether you're buying your first studio condo in Baltimore or selling a luxury waterfront estate in Severna Park, we have the team to make the process streamlined and fun. Ron Howard & Associates is totally dedicated to achieving the highest and best result for every single client—and we know what it takes to guarantee success. All of our associates are real estate professionals who strive for continuous improvement through training and obtaining industry credentials, and who have built knowledge, expertise and people skills through years of on-the-job experience and community service. 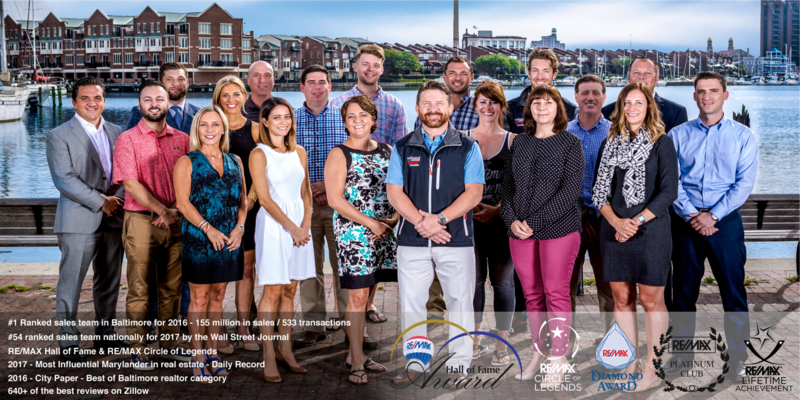 Grounded in professionalism, honesty and integrity, our unique team approach enables us to deliver on our commitment to providing the best real estate services to our clients in the Greater Baltimore area. Need to sell your home? Read more here. Buyers | Search all new home listings in the Baltimore Metro area or get pre-approved for a mortgage. Sellers | Learn more about why our clients' homes sell faster and for high prices than other listings. Our team of agents has been recognized by the RE/MAX global network as a Diamond Club award winning team, RE/MAX’s highest annual award. In addition, Ron Howard has won the lifetime achievement award and was inducted into the RE/MAX Hall of Fame at the young age of 42. Our team has been selling real estate all over Maryland for ten plus years. Our experience with properties from downtown condo’s to surrounding counties estates will make your home buying process smooth, no matter what type of property you’re buying. Buyers don’t pay us a dollar. Most home buyers don’t realize it doesn’t cost anything to use our buyer agent services - our commissions are paid by the sellers. That being said, we will save our buyers money with our experience negotiating the best price and terms for their home purchase. Ron and his team were very easy to work with. They were extremely helpful when we had questions and needed advice. They were very responsive and communicated with us often on the status of our listing. I would highly recommend them and would use them again without hesitation! -Mark R.
Ron Howard and his RE/MAX team are the best! I highly recommend them for buying or selling your home! We recently decided to sell our home and Ron had a contract on it in 2 days! They took fantastic pictures, helped me price my house appropriately, answered all my many questions and made sure it was a smooth process! I am very thankful as they made the process super easy! -Ashley P.